This is an important meeting and will discuss some key questions raised over the last couple of weeks around the premises issue and how we go forward. We would encourage everyone to attend. Hi everyone. Just to let you know our regular monthly “Business” meeting is on this coming Thursday 13th July at the Legion at 2 p.m. All welcome. To update you briefly from the 2nd May blog post below, things are progressing again with the favoured option for a permanent Banchory Men’s Shed site and premises. Advice from those more familiar than we are with the planning process has confirmed our own feelings that Aberdeenshire Planning’s likely objections are themselves “unsustainable”. We are therefore in communication with the Planning department and hope to hear more by the date of the meeting; please come along and find out. We have also therefore put the alternative back on the back burner. “In other news” and as some will know, the Lions in Banchory have closed (see here) but our friends at the Banchory Legion Scotland have taken over the well-known and much-loved monthly Book Sale. The Legion’s book sale will be held as usual on the first Saturday of each month, at the Legion’s own premises in Ramsay Road rather than at the Town Hall. For the first such sale last Saturday (1st July), the Banchory (and District!) Men’s Shed took the opportunity to hold a tool sale at the same time, which raised some useful funds as well as recycling some tools, old and completely new, back into the community. Welcome to 2017 and we wish a Happy New Year to all existing Banchory Shedders and to anyone interested in the Banchory Men’s Shed. 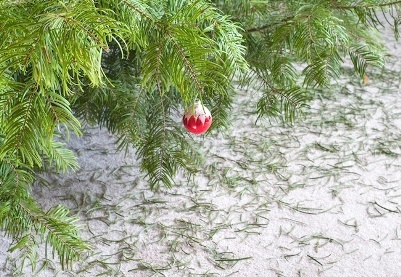 As tonight is Twelfth Night, by now your tree and ornaments are probably down (along with Many Needles!) and you are thinking about the forthcoming return to “normality” as the festive season recedes. This is just a quick blog post to remind you of a few things coming along to kick off the New Year. Our first full meeting of the year will be our meeting next Thursday, 12th January, at the Legion Banchory at 2:00 p.m. Topics on the agenda include progress reports on the two options for a permanent “home” for us, with, I believe, a wee surprise in store. 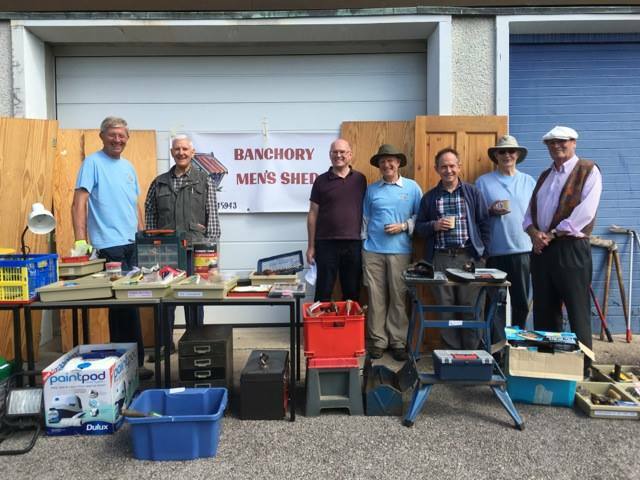 If it’s your first time at a Banchory Men’s Shed meeting and you’re not sure where to go, see our Where page. Before that our first social meeting will be on Tuesday 10th January at the same place, at 10:30 a.m. for about 1-1/2 hours. Tea, coffee and a blether are the order of the day. All are welcome to both meetings and you don’t have to be a member – just come along and see what’s going on. To keep up with the Banchory Men’s Shed, our most up-to-date information is posted on our Facebook site, Howard doing sterling work as always to inform and usually amuse as well. The full web site (this page) is updated as appropriate. To save you having to visit the site if nothing is currently happening, you can deliver updates automatically to your e-mail inbox. Sign up on the right hand side of the page, where it says “Follow this blog by e-mail”, by entering your e-mail address and clicking the “Follow” link. (If you’ve already done the “Follow” area will tell you you’re already signed up). We all look forward to seeing you soon and to a constructive New Year with positive developments for Shed Premises! 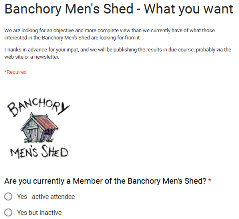 Welcome to the Banchory and District Men’s Shed web site. Our news “blog” and updates appear below. 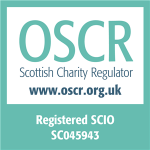 We have lots of other information available about our what our plans and activities are, our history, contacts, what Men’s Sheds are all about and so forth – please see the menu at the top of the page. On smaller devices (Phone, iPad mini) you will find some links and our Funding Thermometer at the bottom of this page. From June we will be changing the meetings format somewhat. When: Our weekly social meetings will remain at 10:30 to about 12:00 on a Tuesday morning, but where it is needed to discuss Shed business a pre-meeting will be held beforehand at 10:00 to 10:30. Where: As well as holding meetings at the Banchory Legion Scotland in Ramsay Road, we will in future also hold our Social meetings in other locations in the community, to both ring the changes and to show our faces out and about. We will advertise the upcoming meeting venues as far in advance as possible both in this Blog and on our Facebook page.